Gerth, Karl. As China goes, so goes the world : how Chinese consumers are transforming everything. Hill and Wang, 2010. Kissinger, Henry. On China. Penguin Press, 2011. In 1980, a group of educators from China came for a tour of my research library at Ohio State. At that time, three massive databanks, Dialog, BRS and SDC comprised the online environment, and librarians with technical training searched them using “dumb terminals” and acoustic couplers. As the Chinese visitors stood there with stony faces, the American translator struggled to explain the mechanics of database searching when there was no word for “computer” in Chinese. When Elizabeth J., a PhD student from Taiwan, dropped by, the visitors crowded around her, showering her with questions. A generation later, Shanghai is among the most advanced cities in the world and China is rapidly developing an American-style consumer culture, due in part to their close association with Taiwan. Karl Gerth in As China Goes, So Goes the World explains that after 1987, a shared history and common interests between China and Taiwan enabled a rapid flow of capital, products and people between the two countries. China offered market opportunities for entrepreneurs and lower prices for consumers. Shanghai accommodated immigrating Taiwanese leaders and visionaries with luxury condos, popular restaurants and international schools. Today Americans and Europeans see China as a gigantic market for consumer products, yet the choices made by these ordinary citizens have profound implications for labor, human rights, social inequality, the environment, and competition for resources. This vivid portrait of China is both enlightening and entertaining, with topics such as China’s transformation into a car culture, the creation of a new aristocracy, and the marketing of counterfeit brands. A dense yet remarkable new book is Henry’s Kissinger’s On China, part history, part memoir by the first American emissary to communist China. Kissinger engineered the U.S.’s 1971 opening to Beijing, after decades of separation. Eventually he made more than 50 trips to China and met with four generations of Chinese leaders. To understand China is to understand its long history. 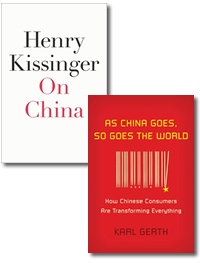 Kissinger provides a historical perspective as he analyzes the philosophical differences between China and the US. He draws on personal experience as he analyzes the country’s approach to diplomacy, strategy and negotiation. He reflects on the future of this global power in the 21st century. This important book is destined to be a best-seller for years. 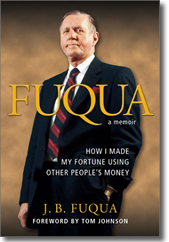 We invite all of our Fuqua students to learn more about the life of J.B. Fuqua, the founding benefactor of the Fuqua School of Business at Duke University. Please join us for an Open House in the J.B. Fuqua Collection Room at the Ford Library on Wednesday, September 28th from 2-5 p.m. to view the awards, honors and memorabilia of this great man. Mycoskie, Blake. Start something that matters. Spiegel & Grau, 2011. In this interesting and readable account , a young man decides to live a life of meaning by pursuing his passion, and by devoting himself to a social cause while simultaneously earning a living. 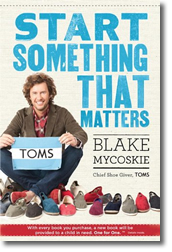 In the book Start Something that Matters, author Blake Mycoskie tells the story of TOM’S One for One, a start-up shoe company that gives one pair of shoes to a poor child for every pair sold to first world customers. The story begins when Mycoskie, a 29 year old entrepreneur on vacation in Argentina, notices that few impoverished rural children there wear shoes. With no experience in the retail business or in the footwear industry, Mycoskie learns to design, manufacture and sell Argentine alpargatas (espadrilles) for the US market. The shoes become fashionable with young people, and at the end of the first five years, a million pairs of shoes have been given to destitute children in South America. Mycoskie shares his story to encourage others to start something that matters and to lead a life of meaning. He shares practical tips for getting started and discusses principles for sustaining the company. He also tells the stories of other entrepreneurs who have led lives that mattered. This inspirational book is about one man who created a movement and made a difference to a million impoverished children. Many years ago when I still worked on Wall Street, I used a set of directories called simply The Yellow Books. There was one for the federal government that helped me locate people within departments that I could never find before and after the internet. It was my one source to find direct contact information for people who made decisions. Fast forward 20 years, the publishers, who also created corporate directories, turned their suite of products into the Leadership Library. This powerful tool allows me to not only look up individuals within an organization, but also search across the entire database for a person’s college, job title, and expertise. The Leadership Library then provides contact information that can include phone numbers and email. If you’re interested in using the Leadership Library and need help, let me know, jnday at duke dot edu. Currid-Halkett, Elizabeth. 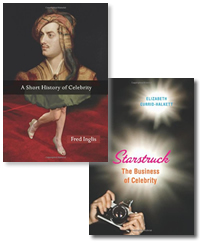 Starstruck : the business of celebrity. Faber and Faber, 2010. Inglis, Fred. A short history of celebrity. Princeton University Press, 2010. The first issue of People was published in 1974 with a picture of Mia Farrow on the cover, but the first cover that I remember was of Charlie’s Angels in 1976. At the time, I was working in a public library in the Midwest, and the community was already devoted to this weekly magazine. And that was three decades before Paris Hilton transformed being a celebrity into a career choice. Recently two books have been published that cast an academic eye onto the meaning of celebrity. In Starstruck, Elizabeth Currid-Halkett explains that the media and the public are obsessed with the lives and personal trivia of celebrities for reasons that cannot be explained by talent. She names the difference between the collective fascination with an individual and their demonstrated talent, the “celebrity residual” and she analyzes the implications of this residual to the economy, as well as to the media and personal services industries. Godin, Seth. Poke the box : when was the last time you did something for the first time? Domino Project / Do You Zoom, 2011. When Poke the Box was published this spring, I ordered it immediately. 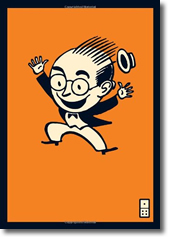 Seth Godin’s previous book, Linchpin, had become a best seller in 2010 and Purple Cow had been in demand at the Ford Library since it was first published in 2003. The Dip (2007) was an amusing little book that explained the art of strategic quitting. The publisher described Poke the Box as a manifesto on taking initiative at work, becoming the person who provokes change and learns from it, instead of remaining the person who waits for instructions. Unfortunately, when Poke arrived at the library, it proved to be 84 pages of brief, disjointed pieces, most less than a page long. The brief format and superficial content seemed more suitable for a blog, and a mediocre one at that. Look for the fear That’s almost always the source of your doubt. While many people could benefit by taking action toward change, instead of reacting passively, reading this shallow book is not time well spent. Not recommended. 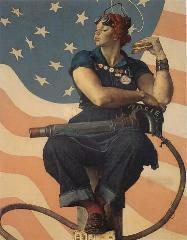 Ford Library will be open for our normal Semester / Term Hours on Labor Day, Monday, September 5th. All Library services and resources will be available except for research assistance. Our expert reference librarians will return on Tuesday, September 6th to help guide you toward success in your MBA. Good Luck in Fall Term 1!